Difference between revisions of "COSMOS Programming Model"
Please find instructions for setting up development environment for i8 [[COSMOS Development Environment Setup i8|here]]. Prerequisite: Import the framework bundles into workspace or install them in the target plaform. 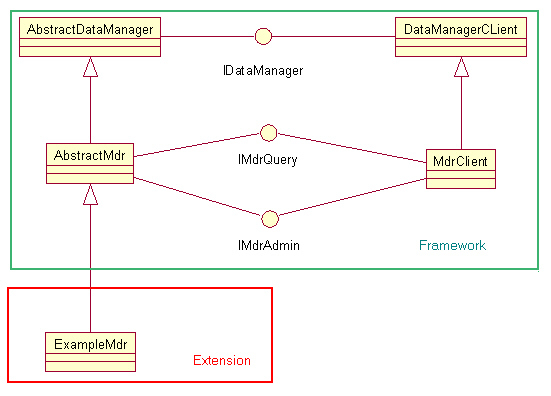 Note: org.eclipse.cosmos.rm.sandbox.dataManager.sml bundle is an implementation of an MDR that uses an SML repository as the backend datastore. Please refer to it as an example for creating an MDR. The following steps show how to create an MDR. * Create a plug-in project: In the "Target Platform" section, select "an OSGi framework", and select "standard" from the dropdown box. Click next to provide plugin ID, name, etc, and click Finish. * Create a plugin project. In the "Target Platform" section, select "an OSGi framework", and select "standard" from the dropdown box. Click next to provide plugin ID, name, etc, and click Finish. * Create a class in this bundle that provides the implementation of the MDR. This class corresponds to org.eclipse.cosmos.example.mdr.ExampleMdr in the Example MDR in the SDK. *Implemnet methods declared in interfaces and abstract methods from super class. For example, the query method takes a CMDBf query as input. Provide adapter code here to parse the query, talk to the data source, and return the response in CMDBf response format. The logic for parsing the query, invocation of APIs of data source and transforming the query output to CMDBf query response can take place in another class or OSGi bundle. *Implement the getQueryHandlerFactory method, which is an abstract method from the super class. This method should return an instance of org.eclipse.cosmos.dc.cmdbf.services.query.service.IQueryHandlerFactory. A query handler factory is a factory class that creates handlers for CMDBf query. 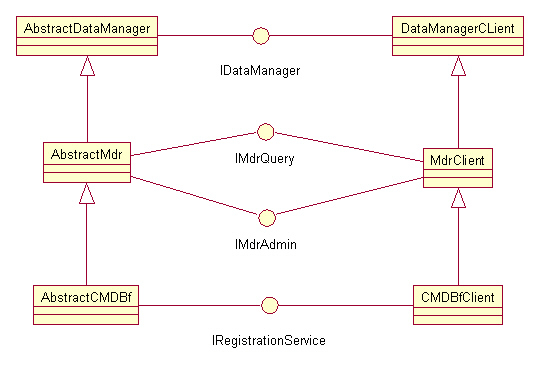 Read more about the CMDBf query processing framework from the [[Providing_a_CMDBf_Query_and_Registration_Service | Providing a CMDBf Query and Registration Service]] wiki page. ** Remove the "start" and "stop" method stubs generated by the eclipse. ** Implement the getDataManagerInstance abract method. The method will return an instance of the class that implements the capabilities. The activator will look like the following. ** Implement the getDataManagerInstance abstract method. The method will return an instance of the class that implements the capabilities. The activator will look like the following. # API bundle: (e.g. org.eclipse.cosmos.dc.sandbox.example.common) This "common" bundle is used by both the server and the client. * The interface declaration is decorated by the following annotation. Namespace is declared as a public constant in the interface class. * Create a new OSGi Framework profile. * Select all plug-ins in the workspace and deselect all plugins in the Target platform. Then click on "Add Required Bundles" button. * Then click the "Add Required Bundles" button again.